IF Agency are delighted to have been appointed by Lancashire Police to develop a creative campaign to widen the understanding of child protection amongst frontline officers and first on scene teams. 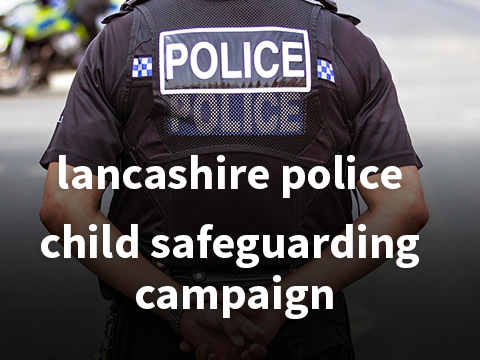 The campaign is part of a new child protection training package which is being rolled out to all frontline officers and staff in the Lancashire Constabulary. The objective is to raise awareness of child protection in all cases and to ensure the child’s voice is at the forefront in all scenarios. IF Agency’s overarching creative concept for Lancashire Police’s campaign uses bold imagery designed to standout, using simple one line headlines, to deliver the key messages to time pressured frontline teams. “We are positioning the campaign to raise awareness beyond the obvious scenarios. Every case where children are connected, whether a child is directly involved, an observer, present within a household or a vehicle, is an opportunity for frontline teams to observe and protect children. It is the intention of the campaign to reinforce and give permission to teams to take the time to safeguard children at every opportunity”.